American Rivers - After thirty years of fighting for protection, California’s Mokelumne River is the latest addition to the state’s Wild and Scenic River system. SUP Magazine - FIBark, the longest-running whitewater festival in the country celebrates its 70th year with ferris wheels, fried food and, of course, SUP cross. 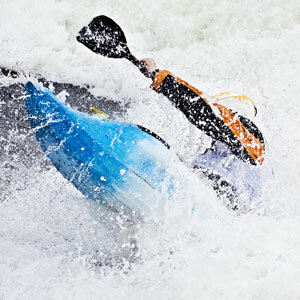 Simon Wyndham - Review: The Pyranha Ripper is one of the most talked about white water kayaks at the moment, and it would appear to be flying out the doors at a rate of knots. Is it worthy of the hype, and what’s it like to paddle for people who’s name isn’t Bren Orton, Kyle Hull, or David Fussilli? TotalSUP - Last weekend saw the the Maui 2 Molokai SUP Race, a traditional race that has been held for the past 8 years and part of the SUP Paddle league regional race. Traversing - Temagami Canoe Festival organizers, in council with representatives of the Municipality of Temagami and Ontario Parks, determined late this afternoon to postpone the outdoor portion of the Temagami Canoe Festival until further notice. SUP Connect - Two women SUP around the 555km coastline of Mallorca raising money and awareness for Marine Conservation. Cat Friend (British) and Valerie Bisbal (Mallorcan) have become the first people to circumnavigate the Spanish Island of Mallorca (Majorca) on Stand Up Paddle boards (SUPs). Canoe Kayak - Here is the first episode of the four-part Paddling Accidents video series, it features a real life incident where a paddler was saved after she was drowning off the coast of Laguna Beach, California. It was her paddling partner who saved her, so it’s good to go paddling with a partner always. Frogma - Just copying an update from Facebook. There was a period in 2015 when I did a few reports on my efforts to achieve a Zero Net Plastic day - I did eventually manage one but it's not an easy thing to do. The Paddler ezine - You asked for it. Following the incredible success of the inaugural Algonquin Outfitters Paddle Art Contest, which doubled both the expected number of entries and the fund raising goal, AO has launched it again, this time in celebration of Algonquin Park’s 125th anniversary (1893-2018). International Rivers - International Rivers' advocacy training in DRC aimed at strengthening the movement of civil society partners and community groups to effectively advocate for the protection of rivers, rights of dam affected communities, and energy access. unsponsored - I wanted to take a week before I wrote this, to gain some perspective, but last Saturday I barely survived a classic leg entrapment on my local run, my comfort river, on a Grade 3+ feature. Here is what happened. SUP Mag UK - Many will know Bill Bailey from the telly box as the Metallica loving comedian, actor and ready wit who graces many a prime time panel show and has appeared on the odd film screen as well. But did you know that Bill is a keen stand up paddler, champion of SUP in the heart of London and the namesake behind expedition SUP brand Billboard SUP? SUPM caught up with BB to find out more.